It’s that time of year when all the festivals abound before the holiday season and winter really sets in. 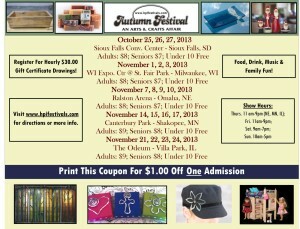 You can have loads of fun at the different Autumn Festival, Arts and Crafts Fairs. You can use this MULTIPLE DISCOUNT COUPON that is good at a number of places like Sioux Falls Convention Center, WI Expo Center, Ralston Arena, Canterbury Park and The Odeum. That’s right! 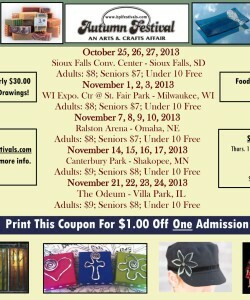 You can catch the fair in South Dakota, Wisconsin, Nebraska, Minnesota and Illinois. If you’re going to be in the area of any one of these, make sure you check it out. There are specific dates, so make sure you have the right ones. Fairs are always good, and they have special drawings where you can win money! Money in your pocket is always a great thing. You can get $1.00 off admission and take your family and friends to go and have some fun, watch the shows and just have an overall good time. Arts and Crafts festivals are filled with beautiful wares and you can probably find a few that you would want to take home with you. It’s completely understandable. There will probably be face painting and shows for the kids and adults alike and more! You can’t go wrong here. Head on down or make a trip of it if you don’t live too far away. Remember – it’s only once a year and it’s almost time for the cold to come beating down. Then you’ll be stuck in the house and wishing that the fair was still in town. Don’t be left out of the fun – grab your friends and family and make it a wonderful day. If you really want, you can drive over to another one weekend.